The long walk to the pitch, as depicted by the game's amazing graphics system. Not so long ago, gamers like myself would readily mock the overall quality of EA Sports‘ FIFA soccer simulator. Digital superstars would move around the pitch in a fashion mimicking a malfunctioning robot. Goaltenders would readily leave their post without good reason, allowing opponents to score goals without opposition. And the game’s graphics engine rendered many of soccer’s famous faces into unforgiving and laughable caricatures reminiscent of a Picasso painting. Still, loyalists shelled out the steep asking price for the sub-par title with the hopes that EA would one day improve their product – – and pose a serious threat to their direct competition, Konami’s Pro Evolution Soccer. Well, the wait is finally over. 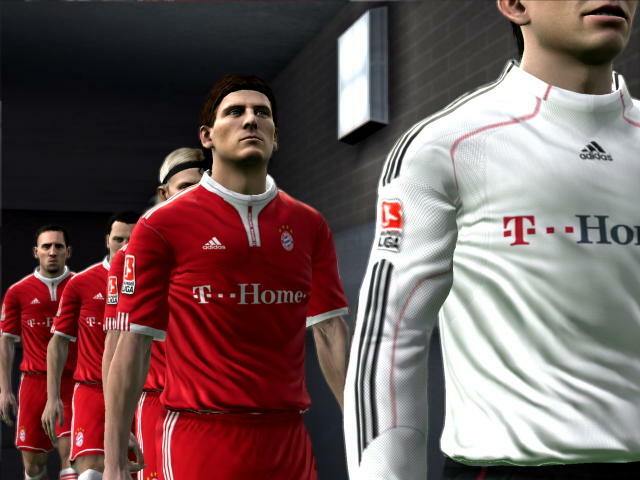 FIFA 11, EA’s latest release in their successful soccer series, is the game soccer fans have been waiting for – – and it is the title that finally conquers PES once and for all. The game-changer in this year’s edition is a new gameplay dynamic called “Player +,” a system which takes into account a soccer star’s real strengths and weaknesses – – which was collected the observations and evaluations of approximately 1700 professional scouts, according to FIFA 11’s official website – – and accurately infuses them into the digital athletes’ in game performance traits. For example, speedsters like Arsenal FC’s Theo Walcott and Tottenham FC’s Aaron Lennon torch the competition with a combination of sneaky dribbling and blazing footwork. FIFA 11 successfully copies their skill set into their digital counterparts, making them virtually uncatchable on the pitch. Also, the virtual counterparts of defenders FC Barcelona’s Carles Puyol and AC Milan’s Alessandro Nesta use their strength and body to dispel advancing opponents from entering their 18 yard box, similar to what the international superstars do during every real life fixture. “Player +”, working in tandem with last year’s revolutionary 360 Dribbling System upgrade, makes FIFA 11 the most realistic next-gen rendition of “The Beautiful Game” to date. In-game graphics also received an overhaul, which is immediately evident once you begin a match. Cutscenes look more fluid and veridical than ever before. Players react to the events on the field with fierce indignation or quiet reserve depending on their guilt or innocence. And the fan favorite post-goal celebrations – – featured in an abundant variety within this incarnation – – look so life-like, it almost tricks you into believing that you’re watching a real game on ESPN or Fox Soccer Channel. Another feature that received a complete re-tooling is Manager Mode, which now combines the former with last year’s newcomer Virtual Pro into a three-pronged gaming scheme coined Career Mode. Now, gamers can either choose to start a career as a player who works their way into a managerial role after retirement, a player-manager who can dictate his agenda both in the board room and on the field, or as a classic manager who implements formations from the sidelines and signs new players to lucrative contracts in between matches. These options add another real world dynamic to FIFA 11’s overall presentation. Online play also returns in FIFA 11 with Live Season, an option which allows gamers to play league matches on game days week in and week out. Pick your favorite league and for a nominal Microsoft Points fee (or purchase all 5 leagues available – – the English Premier League, France’s Ligue 1, Italy’s Serie A, Germany’s Bundesliga and Spain’s Liga BBVA – – at a discounted price), gamers can play fixtures that dictate the success or failure of the team in their virtual league. In Live Season, your skills and tactics, coupled with EA’s regular player trait updates, decide who wins league hardware and who goes home empty handed. Players can also go head-to-head with other FIFA footballers or play the online version of a neighborhood pick-up game in an 11 vs. 11 team play match via X-Box Live. Gamers can also create a Friends League, a fantasy football-like feature where gamers can pick their favorite club and battle over a season long campaign with other pals on their Friends list. As always, FIFA sport up-to-date club rosters – – thanks to the online pairing of X-Box Live and EA Sports’ servers – – featuring real players from all of your favorite leagues like the English Premier League, the Bundesliga and Major League Soccer, something PES has failed to deliver with their offerings so far. Also, FIFA allows you to customize in-game music, fan chants and team stadiums, giving you the ability to tweak every aspect of your FIFA gaming sessions. So far, I only noticed a few bugs in the game – – it took me a while to sync up my X-Box 360 with EA’s servers in order to play online, some of the game modes take a long time to load and the Career Mode prevents you from suiting up as a player with another team if you are previously fired as a player-manager. But one assumes that these hiccups are easily repairable via forthcoming updates through X-Box Live. Simply put, FIFA 11 is now a Bentley to PES’ Ford Taurus – – once you take this luxurious, high-end sports car of a game out for a spin, it’s extremely difficult to go back to the inferior alternatives ever again.